I’m starting off with ‘A’ today and straight away I’m thinking ‘ankle or Achilles tendon’? So I’ve decided the two are strongly connected (pun alert!) and I’ll write about both together. The Achilles tendon is a tough band of fibrous tissue that connects the calf muscles to the heel bone (calcaneus). We could not walk, run or jump while standing on our toes without this tendon. No surprise then it’s the strongest in the body. The ankle joint is a hinged synovial joint which allows motion in several directions. We will look here at the primary up-and-down movement of the foot. I will focus on how this movement relates to the Achilles tendon, how vital it is for normal movement, and how it is related to so many foot problems. · The feet must sustain up to 20 times a person’s body weight during certain sports activities. · Approximately 25 percent of all sports-related injuries involve either the foot or ankle. 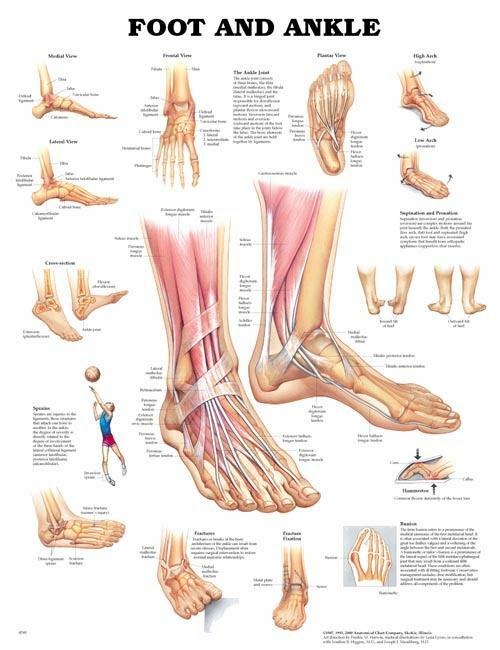 Your feet are a complex system of 52 bones, 66 joints, 214 ligaments, and 38 tendons with their attached muscles. The foot contains 25% of all the bones in the body. Little wonder then, that things can go wrong since there is much to injure. Athlete’s feet are under a lot of stress so you want to keep them in good shape to enhance your performance. From training to competing, people who actively participate in athletic activity are constantly putting themselves at risk for injury. As a podiatrist and Sports Therapist I aim to treat sports foot and ankle injuries as quickly and efficiently as possible, maintaining and enhancing performance or helping athletes to recover and return to their usual activities in as little time as possible.